Digital Systems Design with VHDL and Synthesis presents an integrated approach to digital design principles, processes, and implementations to help the reader design much more complex systems within a shorter design cycle. This is accomplished by introducing digital design concepts, VHDL coding, VHDL simulation, synthesis commands, and strategies together. The author focuses on the ultimate product of the design cycle: the implementation of a digital design. VHDL coding, synthesis methodologies and verification techniques are presented as tools to support the final design implementation. Readers will understand how to apply and adapt techniques for VHDL coding, verification, and synthesis to various situations. 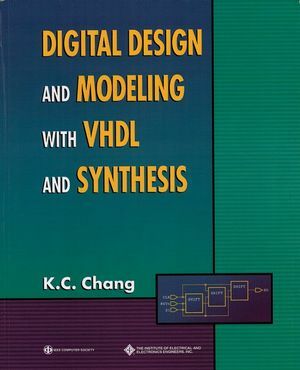 Digital Systems Design with VHDL and Synthesis is a result of K.C. Chang's practical experience in both design and as an instructor. Many of the design techniques and considerations illustrated throughout the chapters are examples of viable designs. His teaching experience leads to a step-by-step presentation that addresses common mistakes and hard-to-understand concepts in a way that eases learning. Test bench, post-layout verification, and test vector generation processes. Practical design concepts and examples are presented with VHDL code, simulation waveforms, and synthesized schematics so that readers can better understand their correspondence and relationships. 1.3 What Is Logic Synthesis?. 2.1 Lexial Elements, Separators, and Delimiters. Chapter 3: VHDL MODELLING CONCEPTS. 3.1 The Concept of the Signal. 3.4 Concurrent and Sequential Statements. 3.5 Process Activation by a Signal Event. 3.6 Signal-Valued and Signal-Related Attributes. 5.3 Concurrent Procedure Call Statement. 5.4 Conditional Signal Assignment Statement. 5.5 Selected Signal Assignment Statement. Chapter 6: SUBPROGRAMS AND PACKAGES. 6.7 Subprogram Return Values and Types. 6.8 Type Casting and Type Qualification. Chapter 7: DESIGN UNIT, LIBRARY, AND CONFIGURATION. 7.3 Port Map and Generic Map. 7.7 Block and Architecture Attributes. Chapter 8: WRITING VHDL FOR SYNTHESIS. 8.1 General Guidelines of VHDL Synthesis. 8.2 Writing VHDL to Infer FlipFlops. 8.3 Writing VHDL to Infer Latches. 8.4 Writing VHDL to Infer Tristate Buffers. 8.5 Writing VHDL to Generate Combinational Circuits. 8.7 Simulation versus Synthesis Differences. Chapter 9: FINITE STATE MACHINES. 9.1 Finite State Machine Background. 9.2 Writing VHDL for a FSM. 9.4 FSM Flipflop Output Signal. Chapter 10: MORE ON BEHAVIOURAL MODELING. 10.1 File Types and File I/O. 10.4 Attribute Declaration and Attribute Specification. 10.5 Access and Record Type. 10.7 Guarded Signal and Null Waveform. 10.9 Writing Efficient VHDL Code. Chapter 11: A DESIGN CASE AND TEST BENCH. 12.2 Describing ALU with VHDL. 12.4 Simulate the Design with a Test Bench. Chapter 13: A DESIGN PROJECT. 13.5 Layout Backannotation and Verification. 14.8 File and Text I/O. Appendix A: VHDL'87 QUICK REFERENCE. Appendix B: DECLARATION PART TABLE. Appendix C: VHDL'93 GRAMMER AND SYNTAX REFERENCE.